I met Dr. John Medina while attending the National Association for the Education of Young Children ( NAEYC). He was the one who inspired me and got me hooked on Empathy. I was always the type to be kind and gentle towards children (and adults), but his words spoke to my heart and that eventually became my teaching philosophy, and philosophy on how I live my life as an individual. 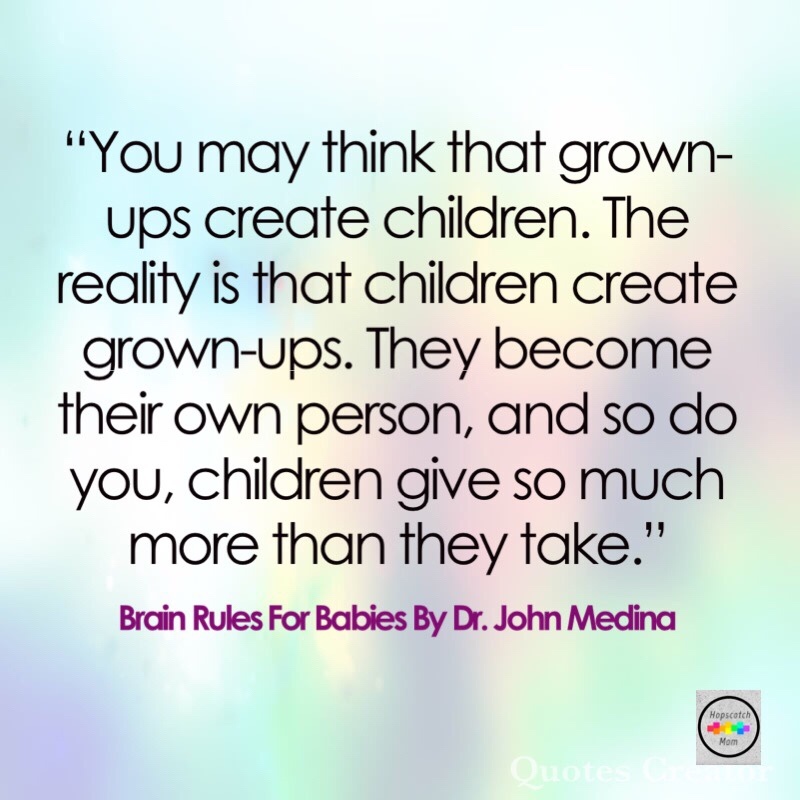 Dr. Medina’s book Brain Rules for Babies, I must’ve purchased as part of the gift set I’ve created for every baby shower I ever attended. This quote was one of the many quotes that stood out in his book. He elaborated in his book on how when a child presents with different scenarios in your life, such as an ear infection, they are teaching you patience. He also goes on to say how when your child throw tantrums, “…they are really giving you the honor of witnessing a developing personality.” I thought to myself , “Wow, how true that is!” We are presented with children in our lives who are all so special in their own ways. The child is always growing and learning from everyone around them. We are given clues on what type of adults they will be. We are given a reminder they have their own personalities, just like us; and can have a variety of feelings. However, I do also feel the quote can be interpreted the other way as well, because I also feel grown ups create children . What we do and say, children see us as role models; they look up to us as their care takers, mommies, daddies and teachers. How we react to their behavior, they will learn. If we react to their feelings with empathy, they will learn empathy towards others. If we react with respect, they will learn to treat others with the same. If we get upset and get angry or annoyed (no one is perfect, it happens to the best of us), they will learn that it’s okay to be sad, but do you show them that things will get better? Do you show them it’s ok to be angry, but there are ways to calm down from being angry? Do you embrace their emotions so that they can be true to them and share them with you? What are some ways your child has taught you something about yourself? About life?